The hypocritical attack by the IRS and US Attorney Melinda Haag against California medical cannabis dispensaries, particularly in Oakland, feels like it’s right out of a Kafka novel. On the one-hand, the feds (which include the IRS) adamantly maintain that the possession and sale of medical marijuana is illegal because pot is considered an unlawful controlled substance under federal law. But at the same time, the IRS maintains that any proceeds from the sale of medical pot by dispensaries to members of their cooperatives are taxable. On its face, this double standard is ridiculous. But the Internal Revenue Service’s mind-bending arguments don’t stop there. 1. The feds say medical cannabis dispensaries are illegal. 2. But the feds say these illegal entities must pay taxes like legitimate businesses do. 3. However, the feds say that dispensaries can’t deduct their legitimate business expenses like other businesses do. The number-3 above is the argument that the feds are using to drive Richard Lee’s legitimate Oaksterdam businesses out of business. And the IRS is using the same hypocritical argument to try to shut down Oakland’s Harborside Health Center, the largest medical cannabis dispensary on the West Coast and a leader in California’s medical pot community. The IRS claims that Harborside owes more than $2.5 million in back taxes because it made routine business-expense deductions. 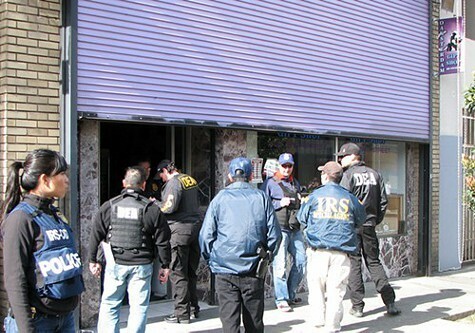 The IRS and other federal agents raided Oaksterdam last week. The sheer ridiculousness of the IRS’s claims makes the agency’s motives obvious: It wants to eradicate medical marijuana in California. But the feds know that if they started shutting down pot clubs, under the rubric that medical cannabis is illegal, the public outrage in California would be immense. Polls have repeatedly shown that Californians overwhelmingly approve of medical cannabis. Knowing this fact, the feds are twisting themselves — and the tax code — in knots to come up with justifications for snuffing out medical pot in the state. Haag has used the same type of absurd reasoning to justify her medical pot crackdown. Again, she knows that simply shutting down dispensaries is out of bounds. So, instead, the federal prosecutor has targeted clubs that she says are too close to schools. But like the IRS, her motives are transparently obvious. For example, in Berkeley she is trying to shut down the Berkeley Patients’ Group dispensary even though the mayor of Berkeley, Tom Bates, strongly opposes the idea because BPG is one of the most respected businesses in the city. Haag claims that BPG is too close to a nearby private French school, Ecole Bilingue de Berkeley. Yet Haag ignores the fact that the school has repeatedly said that it’s totally fine with BPG’s longtime location. In Oakland, meanwhile, Haag has forced Lee’s Coffeeshop Blue Sky dispensary to move repeatedly using the same argument — that it’s too close to schools. But what she doesn’t mention is that one of the schools in question is the Oakland School of the Arts, a charter school founded and still controlled by Governor Jerry Brown. Like the French school in Berkeley, Brown has expressed no qualms about his school being near a dispensary. In fact, Brown used his considerable influence when he was mayor of Oakland to put the school in its current location inside the Fox Theater, knowing full well that Lee’s dispensary was nearby. And Brown has never once attempted to force Lee to move. In a letter to the landlord of at least one Bay Area dispensary, Haag, like the IRS, contorts federal law to achieve her goals. She notes in the letter, which was obtained by the Express, that possessing and selling pot is illegal under federal law. But she effectively blows past that statute, and says that she's targeting certain dispensaries because of a federal penalty "enhancement" for selling pot near schools or playgrounds. That's like saying, "I'm not going to prosecute you for assault — unless you use a knife." In truth, Haag knows full well that numerous dispensaries throughout California currently run afoul of the penalty enhancement she cites. But simply closing them would spark public outrage, so she uses the too-close-to-children excuse. But that ignores the fact that most dispensaries run clean and safe operations, and expressly prohibit the sale or use of cannabis outside their operations where schoolchildren might be watching. Haag also seems to be hiding behind California law, which regulates the distance between schools and dispensaries. As such, Haag has, in effect, unilaterally appointed herself to be the enforcer of state law — an unusual, and ethically questionable, move for a federal prosecutor whose primary responsibility is to uphold federal law. It’s also worth pointing out that Haag, as a result, appears to be trampling on the jurisdiction of state prosecutors whose job is to uphold state law. In Oakland and Berkeley, that job belongs to Alameda County District Attorney Nancy O’Malley. And on the state level, it belongs to California Attorney General Kamala Harris (and Brown before her when he held that position). It’s also worth nothing that neither O’Malley nor Harris has ever expressed any public concern over the location of BPG or Lee’s dispensary. But that’s not her job. Nor is it the place of the IRS to use taxpayer dollars to finance a Holy War against medical cannabis in a state in which the citizens have repeatedly condoned its sale and use. Note: This post was updated to reflect the fact that Haag is also contorting federal law to justify her actions, much like the IRS.